All emails kept under lock and key, and will be used for no other purpose. On January 3, 2009 the first event on the Bitcoin block chain occurred. Its founder placed an important notation indicating the intent behind what he had just created. 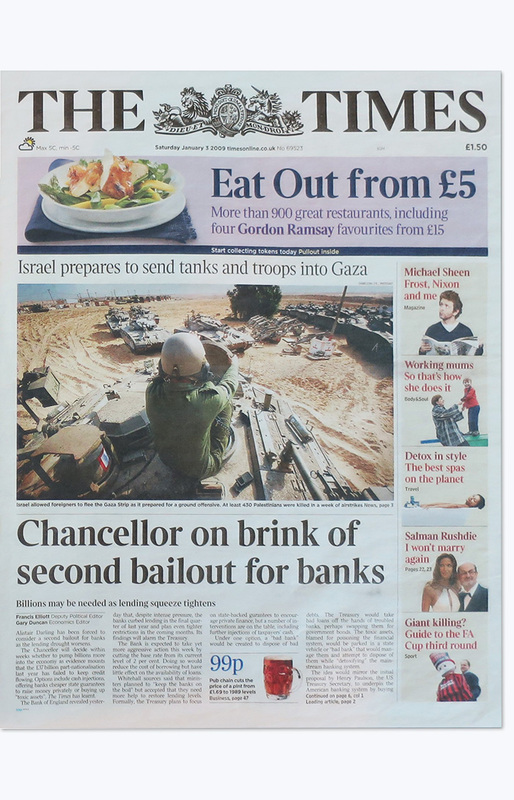 The London Times ran a cover story entitled “Chancellor on Brink of Second Bailout for Banks”. This title was quoted and embedded into the very first transaction ever to be included in the new Bitcoin block chain, by Satoshi Nakamoto. The block containing this transaction was called The Genesis Block. Bitcoin is “The World Wide Ledger”. A new economic infrastructure where fiat value can be moved to, reducing Banking and Government control over the money supply. Enabling consumers to control their own money, without permission, or the need to trust a 3rd party. Immune from government seizure or theft. 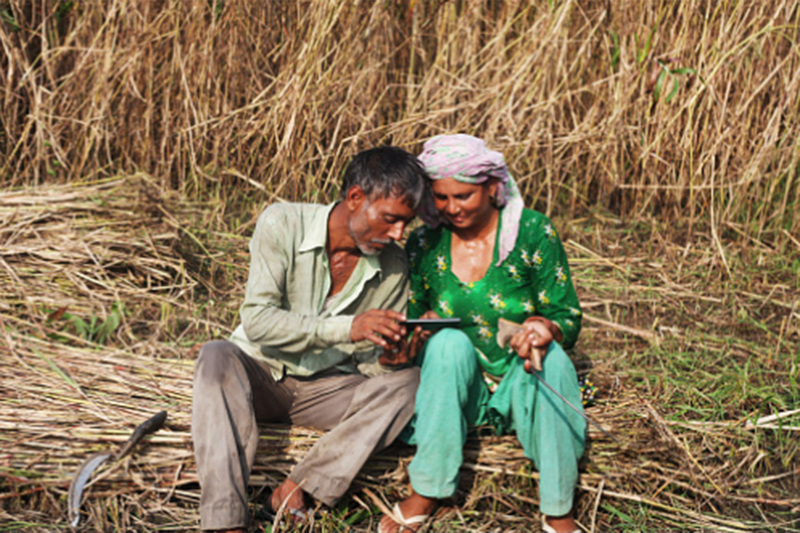 For the first time over 6 Billion un-banked citizens can tap into a global economy with nothing more than a smartphone. This newspaper is the most rare, and most valuable crypto collectible in existence. Actual copies exist, but to date, only 2 have been verified by the individuals running this site. If you have an authentic copy of this newspaper, we encourage you to contact us, so that we may both document its existence, and assist you should you decide to sell. We have been collecting an interest list for several years. If you are a serious collector and want an authentic copy of this document, please enter your email at the top of this page to be kept on an interest list. Your information will not be shared for any reason whatsoever. You can also bookmark this website and check back periodically to see if any copies are available for sale. See below. When Satoshi wrote his comment on the Genesis Block, he picked the title for a reason. It implies the disruptive and revolutionary freedoms associated with financial block chain technologies. Original Copies of the Genesis Block Newspaper. The only two remaining verified complete copies of this newspaper were acquired from the London National Archives on January 14, 2014. 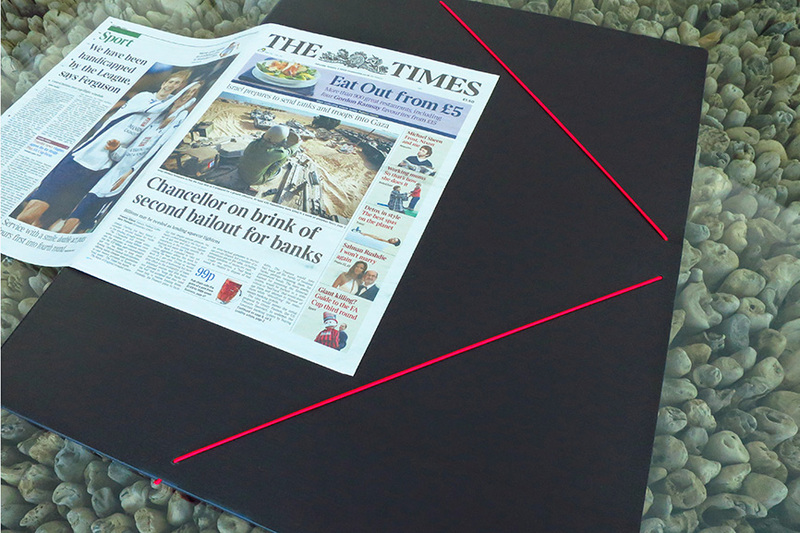 The newspapers come in a complete set with both the cover and the entire newspaper included. 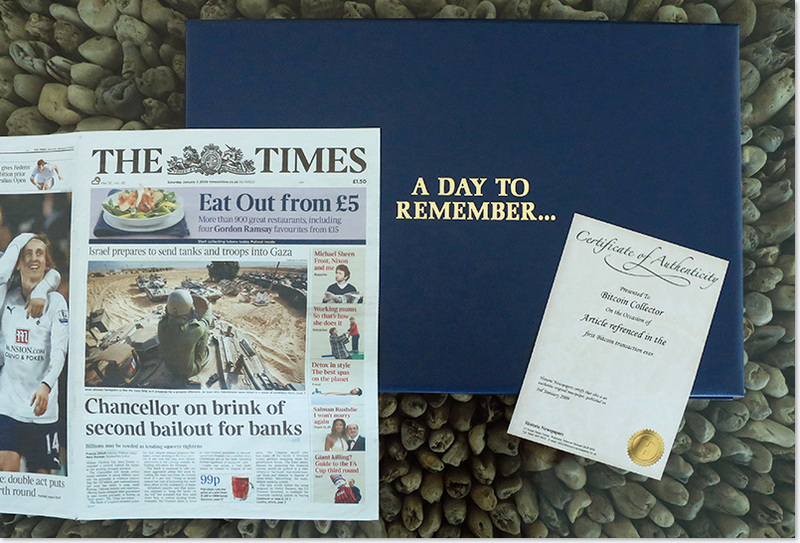 Both come with a certificate of authenticity from the archival company, and one comes with an engraved storage folder mentioning the Genesis Block and the Satoshi Nakamoto quote, as well as its relevance to the Bitcoin block chain. Verifying authenticity of Bitcoin Times Jan 2009 Newspapers. Some high definition scans of the newspaper have been circulating lately, so there is a chance of fake copies floating around as just the cover page, printed on newspaper material. Before spending money on this collectible, you should require the entire original newspaper, including all inserts (of which there are many), and a paper trail of purchase history. Certificates of Authenticity provided by the archival companies contain no identifying stamps, serial numbers, or anything that might actually prove that the paper is an original. We have provided numerous photos of what comes in a complete set with this newspaper to help you identify what is legit and what might not be legit. 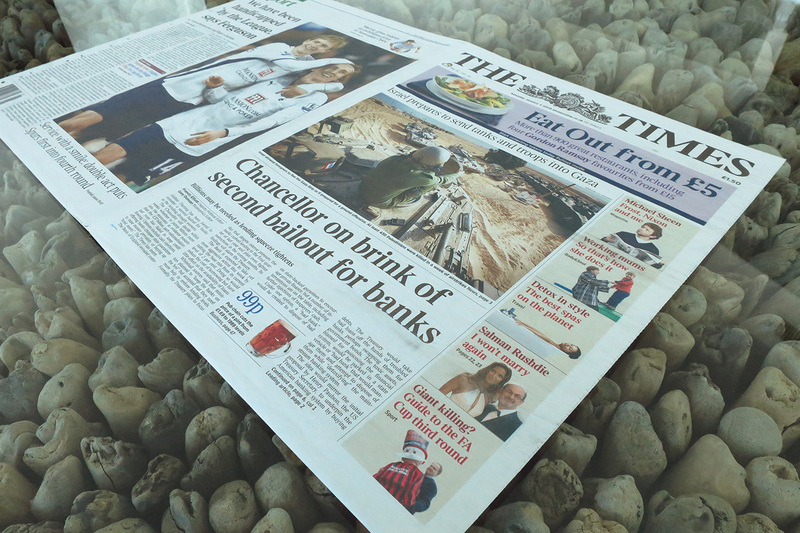 Insist on the complete Newspaper – Not just Front Page. Only 8 verified copies of this newspaper exist. 1 additional copy is unverified but we’re in contact with the owner. 2 additional copies may exist but we have no verification or contact. All archival companies in the UK have been contacted and confirmed to be out of stock. 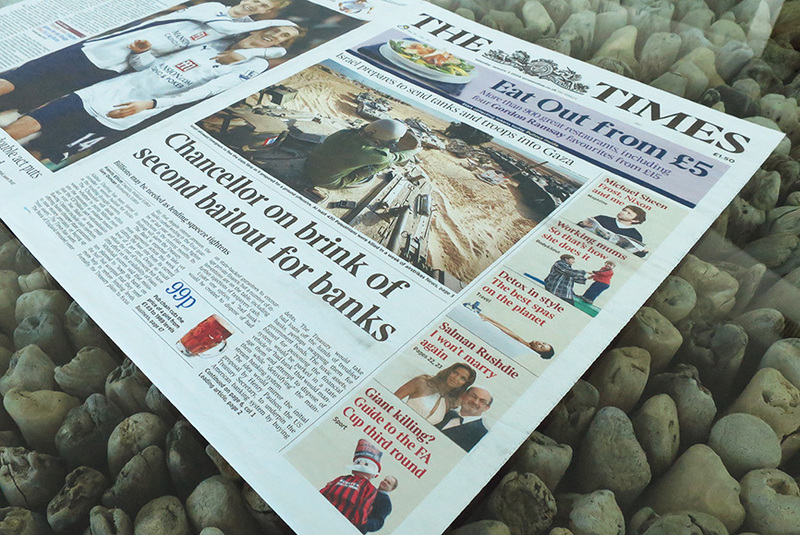 Ads were placed in local UK publications and online markets offering substantial amounts of money for copies. No responses were received. Far more common Casascius Coins have been sold on eBay for $10,000. There were 1,300 of that coin created. These newspapers are exceptionally more rare, and have much greater significance. Bitcoin is a world-wide financial paradigm shift. Given the opportunity to come to fruition, it is poised to be recognized as a new world reserve currency that entire nation-states may rely on. Value is determined by scarcity. There are only 8 verified copies of this newspaper in existence. Do you have a copy of the Genesis Block Newspaper? Please get in touch and let us know. Your personal information will not be shared without permission. We would just like to keep an accurate count. Controlling your own money. Without Permission.